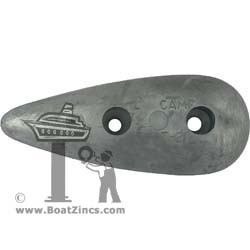 A full-range of bolt-on aluminum anodes for small to large commercial vessels and underwater metal structures. Available in weld-on and bolt-on styles with either steel or aluminum inserts cast as integral parts of the bars. Better protection and longer life than zinc! 10 lbs 12" 6" 1-1/4"
AHC-20 18 lbs 12" 6" 2-1/2"
AZSC-24 (AP5B2) 12 lbs 24" 3" 1-1/4" 12"
AZHC-50 (AP7B2) 20 lbs 24" 4" 2" 12"
AZSC-12 4 lbs 12" 3" 1-1/2" 6"
AZ03B 4 lbs 12" 3" 1-1/2" 8"
AZ15 6.5 lbs 18" 3" 1-1/2" 9"
AZD72BM 6.5 lbs 18" 4" 1-1/2" 8" or 9"
AZD72B 12 18" 4" 2-1/4" 9"
2.1 lbs 11" 9" 3" 1-1/4"
AZ12 0.3 lbs 2" 4" 1-1/4" 1"
AZ13 0.7 lbs 3-1/4" 6" 1-3/4" 1"
AZ14 1.5 lbs 4" 8" 2-1/2" 1-1/2"